D made this one, so I had to get his take on this dish as a recipe. As an eater, I loved it. He remembered that we’d made this one before with water-packed tuna and added our own olive oil. 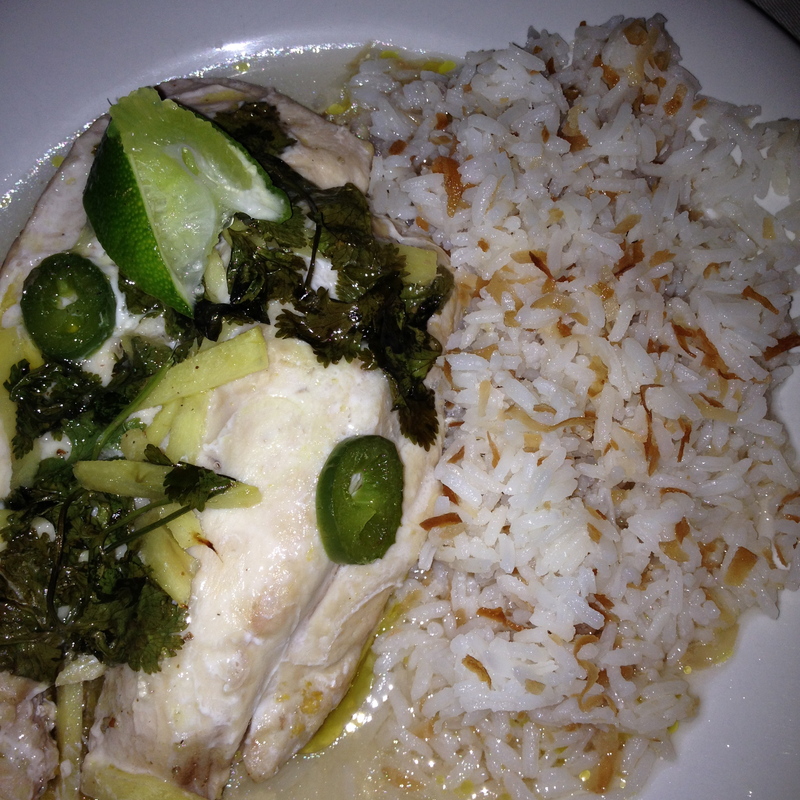 He said that was better than reserving the oil from oil-packed tuna. I would agree with him. Oil-packed tuna is kind of weird. It spread out all over the salad instead of staying in chunks. The texture is a little mealier. But here’s the really important point: there’s no tuna water to give the cats. I’m surprised they let D live. Seriously. I cannot imagine what he went through opening two cans of tuna, draining them, releasing the tuna aroma into the air, and listening to the incessant meow of two housecats who are. not. having. it. Sorry, D. So we highly recommend water-packed tuna, especially for cat owners. This also lets you use your own favorite olive oil instead of whatever the tuna people use. We were also out of red wine vinegar. Well, that’s not entirely fair. We were out of it on purpose. 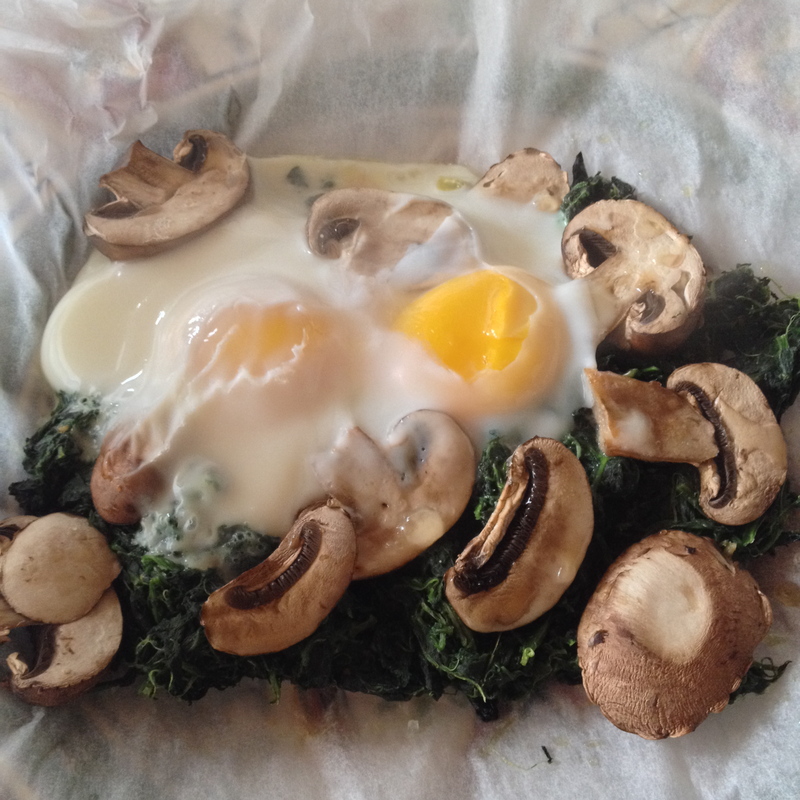 I’ve been trying to use up all of the random ingredients in the fridge, freezer, and pantry. To that end, I used up the red wine vinegar about a month ago and haven’t bought more. D used balsamic instead. 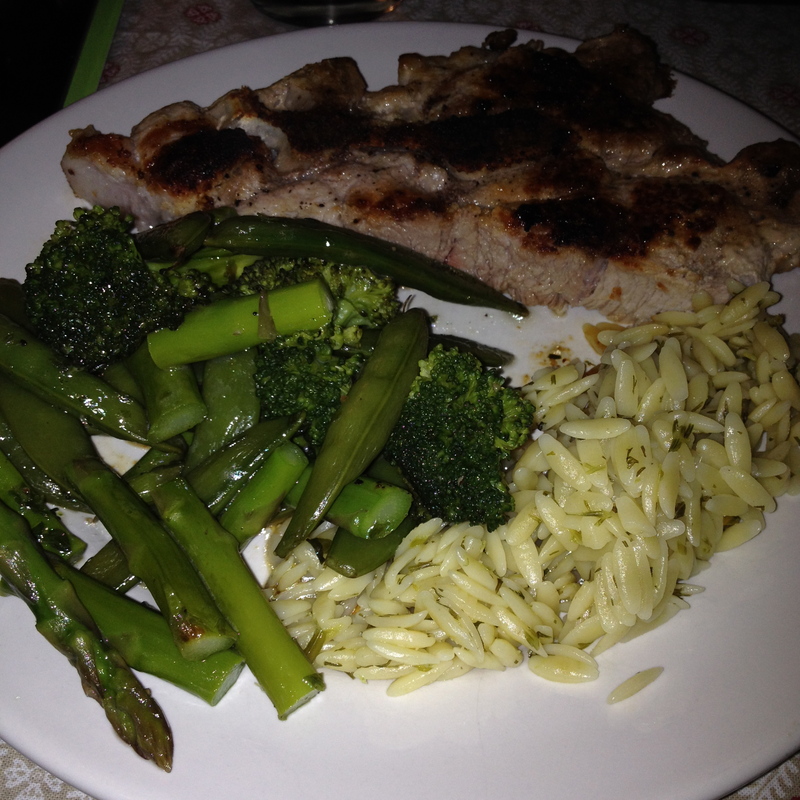 It was good, but it was better with red wine vinegar. So it’s time to replace the red wine vinegar. Fair enough. One substitution was very successful. D used up the last of the black Moroccan olives that we purchased for who knows what recipe. I’m telling you, getting these random things out of the fridge feels very good. Upshot: Even with the slight problems with substitutions, this is a good recipe. It was a very nice, hearty meal. 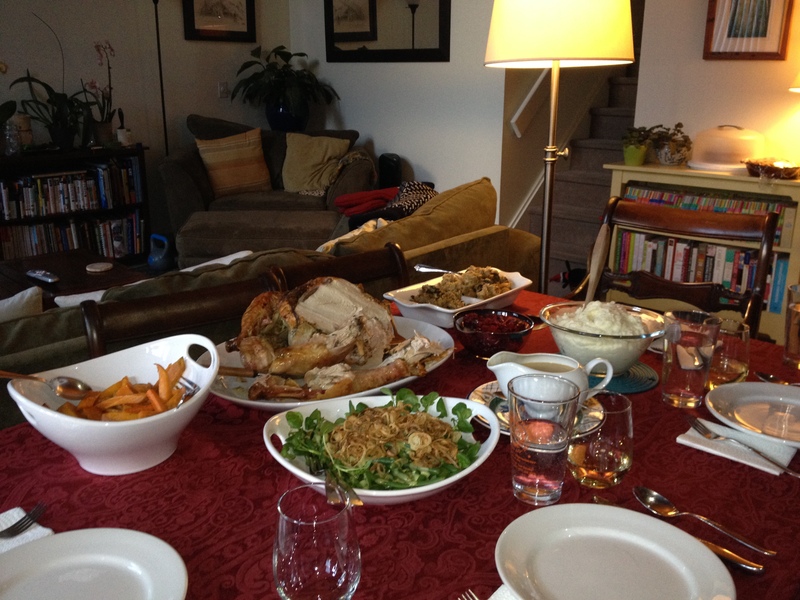 Well, I told you I would be back with an epic post concerning my Thanksgiving Dinner. I think the best way to get started is to just show you the splendor. Food, glorious food! What wouldn’t we give for that extra bit more — That’s all that we live for. Why should we be fated to do nothing but brood on food, magical food, wonderful food, marvellous food, fabulous food, beautiful food, glorious food! 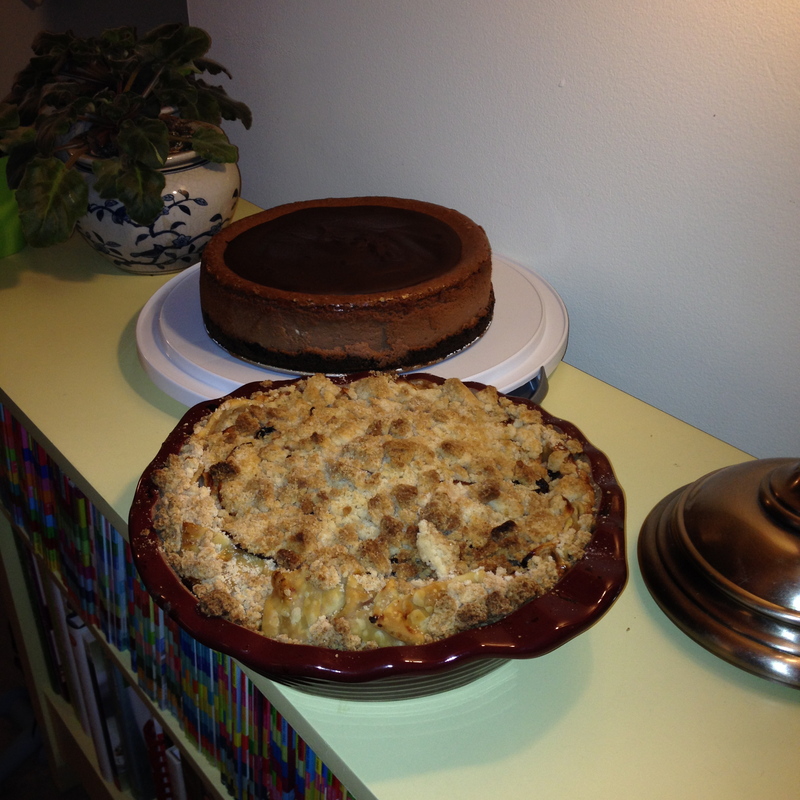 Yes, I made two desserts to feed a total of four people. I don’t see anything wrong with that. My day started out pretty early, getting the stuffing ready to go. To make the mushroom and sage variation you add 1 lb of mushrooms (I used cremini) and 1/4 teaspoon dried rubbed sage after you have softened the vegetables in step 1 of the Simple Stuffing recipe. After the mushrooms have released their liquid you continue with the recipe by adding in the white wine. I thought the stuffing turned out pretty well, although in the future I think I would try to cut up the bread into slightly smaller pieces. It didn’t all congeal together exactly as I expected and I am fairly certain it was user error. 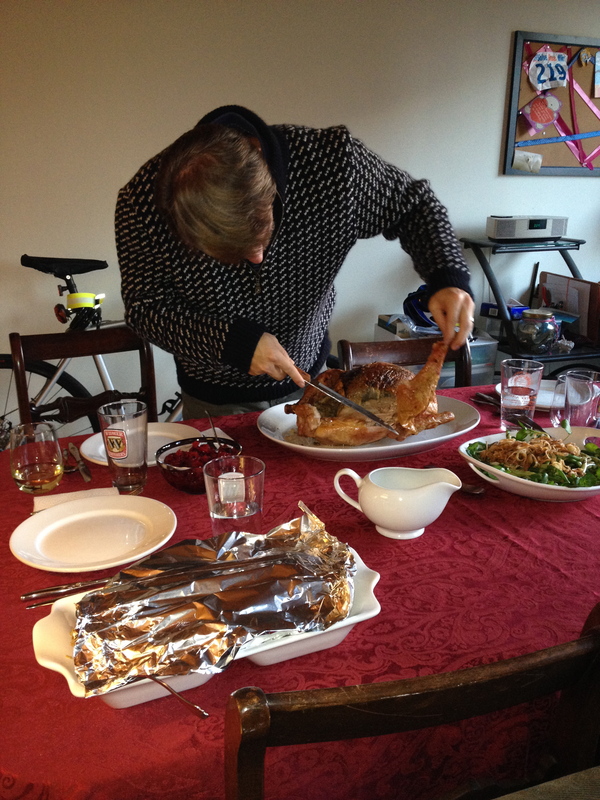 Once the stuffing was made, I did actually stuff the turkey. Let me first say, I took the turkey out of the freezer on Saturday and the damn thing was still frozen solid on Wednesday morning. I spent a good part of the day running cool water over it to let it thaw out safely. Luckily, come Thursday morning it was in good shape to get stuffed! The herb rub for the turkey is also very simple. You just gently lift the skin from the breast and spread the mix of three herbs, salt and pepper under there and rub it into the meat a bit. Now, by some small miracle, this turkey decided to keep all of its moisture inside itself. 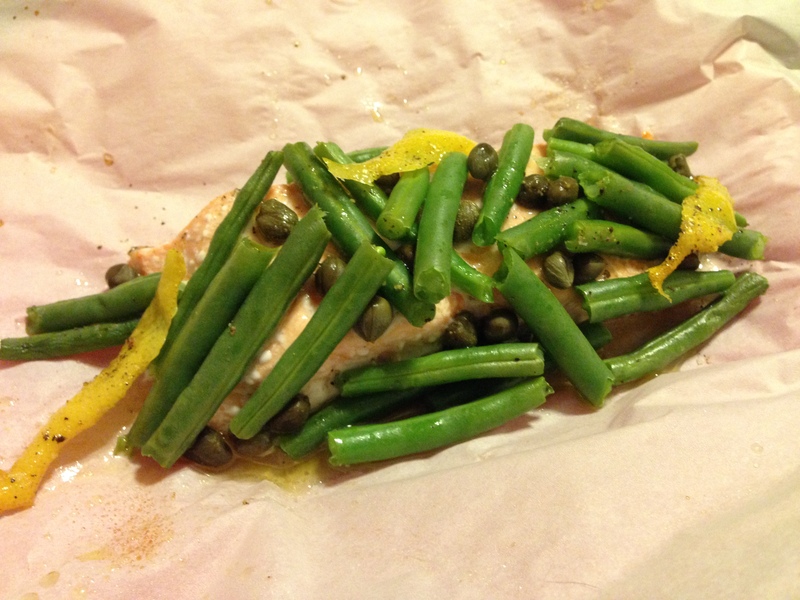 The recipe indicates that you are supposed to start basting after an hour in the oven. There were literally no drippings after one hour. I waited for an hour and a half, still nearly no drippings. I was getting scared for my gravy at this point so I added about half a box of chicken stock to the pan so I could do a little basting. When the turkey came out, it was beautiful. The intensely dark stuff under the skin is the herb rub. 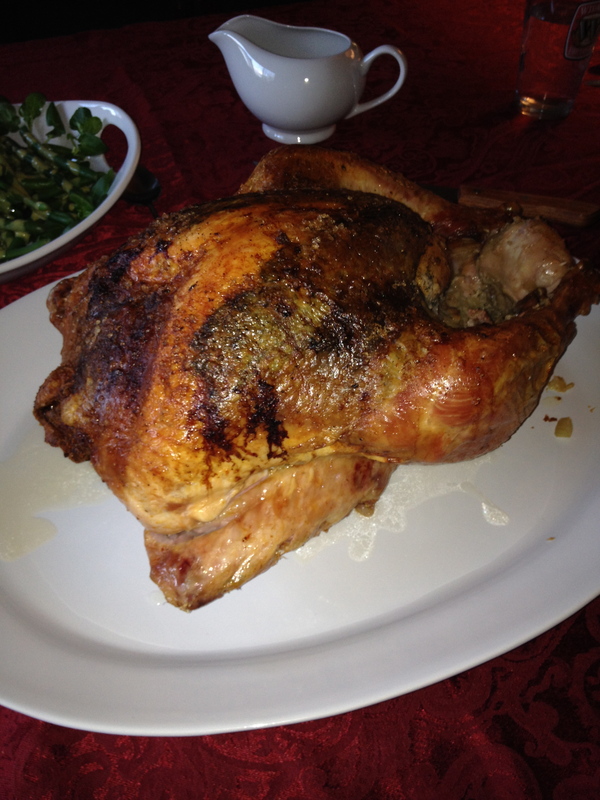 And yes, the turkey had still refused to give up its juice when I finally took it out of the oven. I technically even overcooked it because the breast was at nearly 190 degs when I pulled it out. Like I said, total miracle. That was one super juicy turkey. 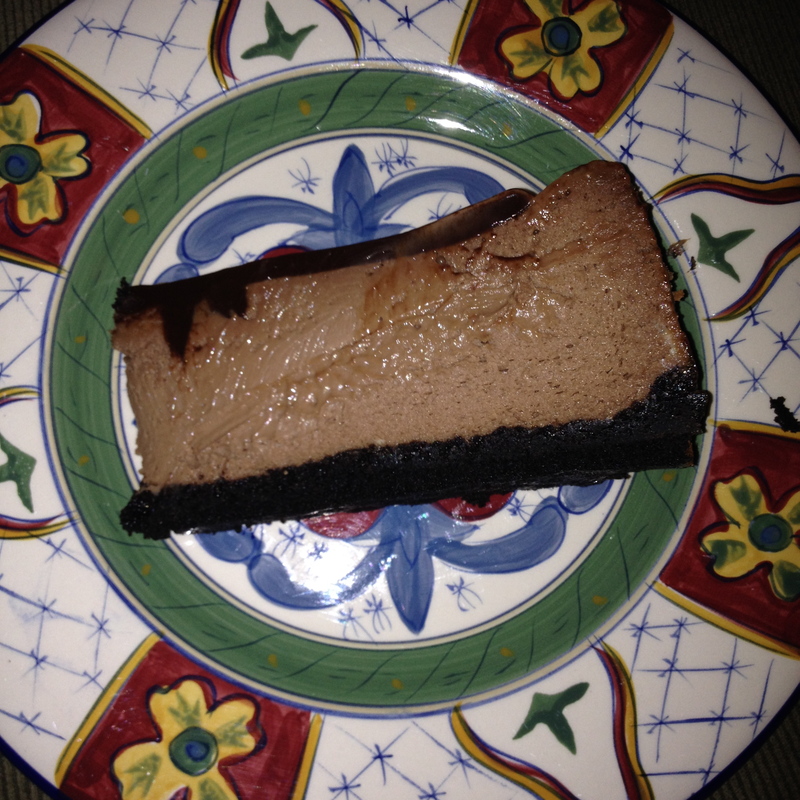 I let it rest for around 45 minutes before we cut into it, but it was completely perfect. The herb rub under the crispy skin was so savory. My step-dad doing the honors. For the most part, the sides were all fairly healthy. 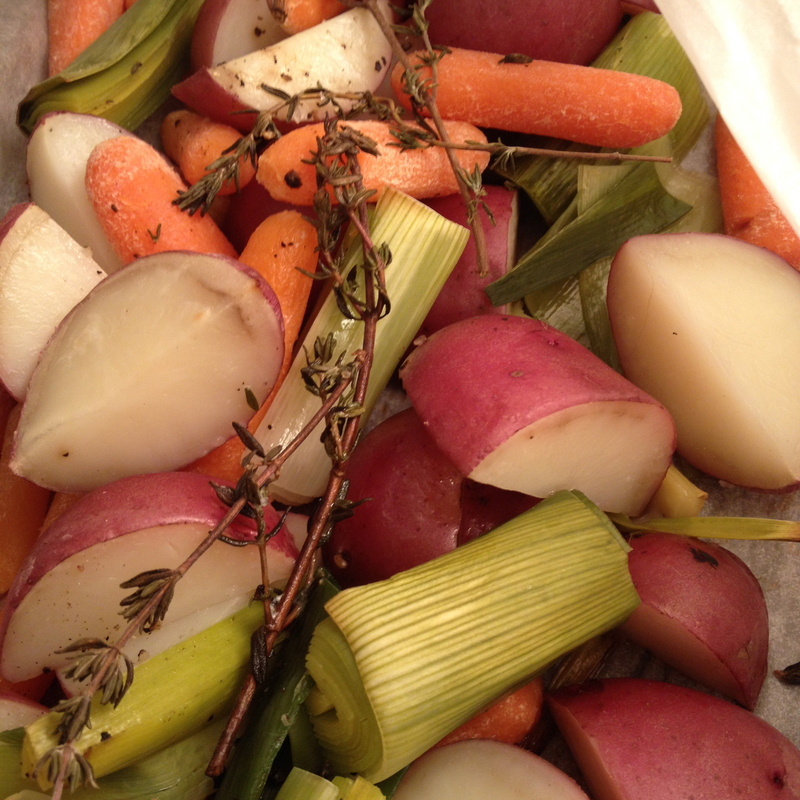 The roasted harvest vegetables were delicious but also light. The garlic that was roasted with it really flavored everything thoroughly. And they were a totally beautiful color. 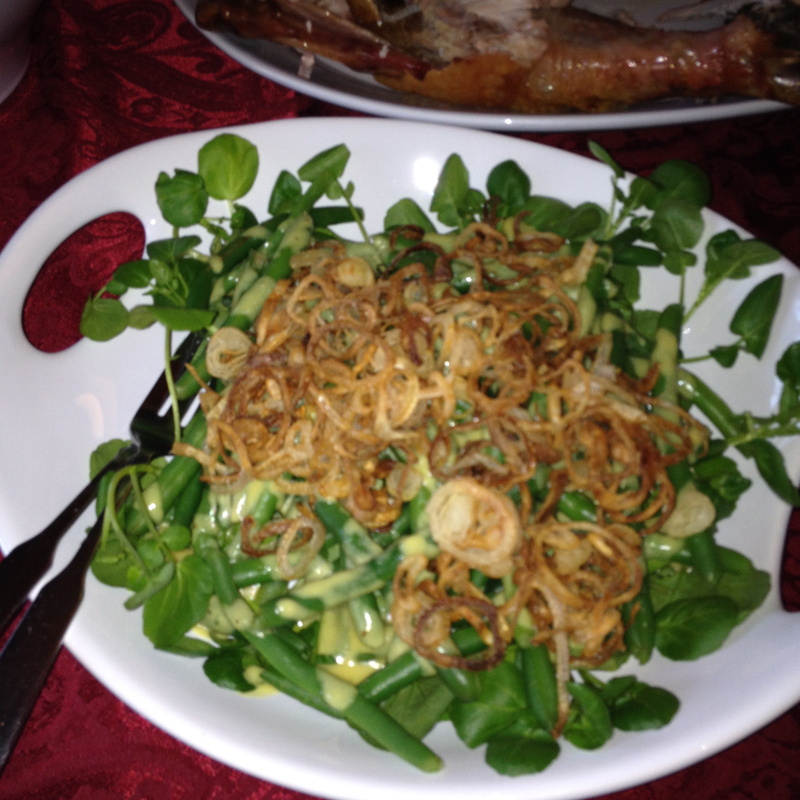 The green bean, watercress and crispy shallot salad might be my new favorite thing. I’ve told you I love shallots. I will just add to that love now by saying that crispy fried shallots cannot be beat. They taste just like those french fried onions that you put on top of green bean salad but you have the extra satisfaction of making them that delicious yourself. And the lemon-mustard vinaigrette is incredible. The gravy was also awesome. I love adding white wine to my gravy. The one thing I refused to follow in the recipe was the instruction to add water. I would never ever want to thin all that flavor. Especially when I struggled so to get any drippings to make my gravy with in the first place. 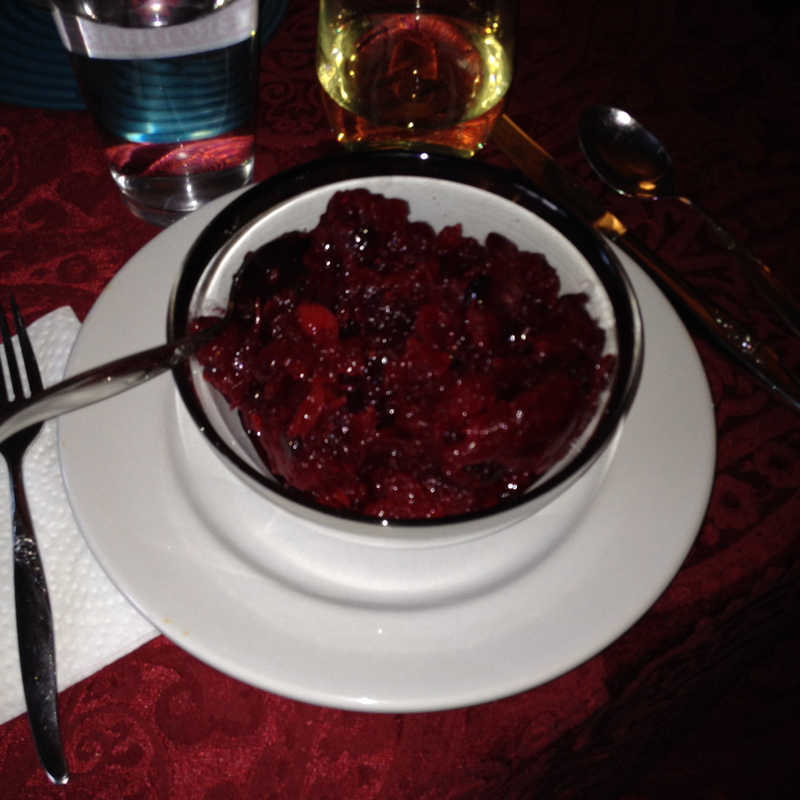 And I normally am very strict about eating only cranberry orange relish made in a food processor. It’s what I grew up with. It’s delicious. I was brave. 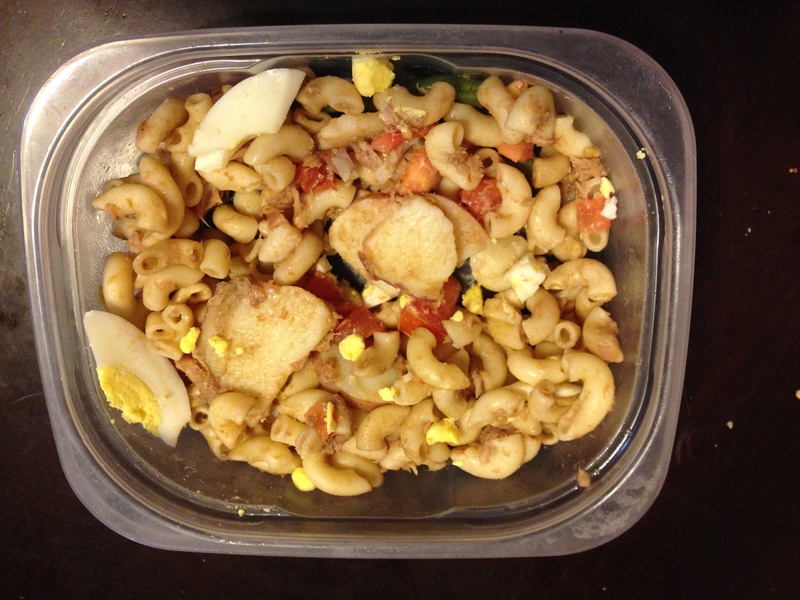 I tried something new (even though I was contemplating making both relish options for most of the week…). It was worth it. I love ginger. I love cranberry. It all went really well together. It was super yummy and even more so when it was mixed in with all the gravy and potatoes and turkey. This also had an awesome color. Like a jam full of rubies. Delicious soft rubies. Yes, I will make it again. And now, on to the dessert. The pie was super tasty. I had a slight mishap. Either my pie crust was not big enough, my pie plate was too deep, or the recipe was way off when it called for 4 lbs of granny smith apples. It definitely didn’t all fit. I had to put probably half a pound in another dish to bake on its own and I also had to make a little more of the crumb topping to make sure I could cover the whole thing. I also had to add a little nutmeg, because… I had to. But after all that, it was awesome. Super fruity and dense and just sweet enough that I didn’t feel guilty chasing it with a piece of cheesecake (it counted as a fruit serving right?). So very very very chocolatey. This was the first cheesecake I ever made, so it was a bit of an experiment. Despite following instructions, it cracked anyway, but I just turned it into a ganache canyon. Yeah. That’s right. Ganache canyon. The texture of this cheesecake is super creamy. I’m amazed at how perfect the texture was considering it cracked (I assumed that meant it was overcooked). And the crust managed to taste kind of like a brownie. So decadent. So that was my Thanksgiving everyone. My very first time hosting. I followed the make ahead instructions in the magazine for just about everything which made the day of pretty easy. I was cooking for most of the day but at a steady and stress free pace. I even had the time to post about the lovely Baked Brie with Pecans. I hope everyone else’s Thanksgiving was as stress free and enjoyable as mine! Happy Holidays!!! Slice a pound of beef tenderloin or sirloin into 8 slices. Place each slice between pieces of plastic wrap, being careful not to let the plastic wrap do the thing that it ALWAYS does where it sticks to itself, pound lightly until 1/8 inch thick. Place delicate, little slices of bell pepper and green onion on to the slices, roll them tightly and secure with a toothpick. Brown them on the stove. Still with me? I’m not. I didn’t do any of this. I took that beef, the bell pepper, and the green onion, chopped it into pieces and stir fried it in a non-stick skillet. Then I added the soy sauce, vinegar, and sugar, made an awesome sauce and tossed it all together. You know what? It was good enough for me. The bok choy and broccoli was probably a bigger hassle than the beef just because of all the prep it takes to cut up those vegetables. I also overcrowded the pot and wound up jamming things down in there haphazardly. 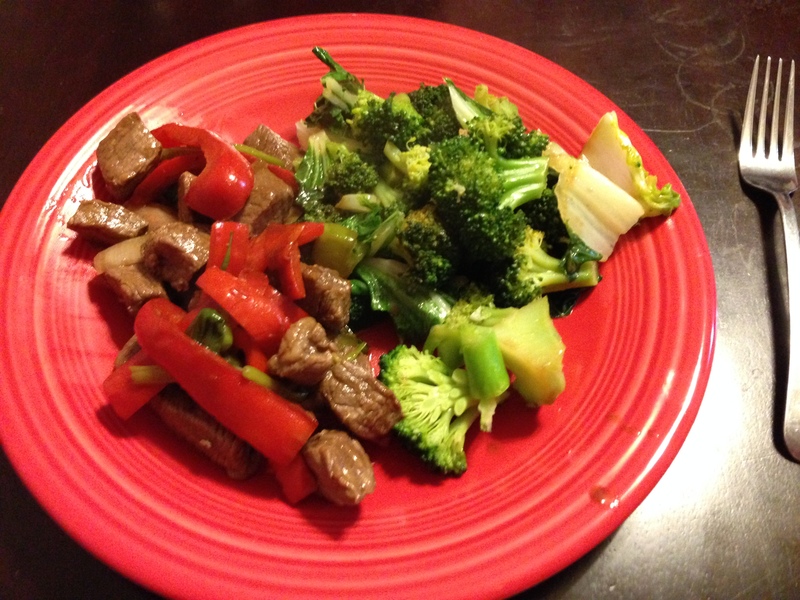 It has a wonderful flavor and goes perfectly with the beef and scallion stir fry. Know why most of the entree is gone? Because we got tired of waiting for the beans to be done. What’s French for tedious? 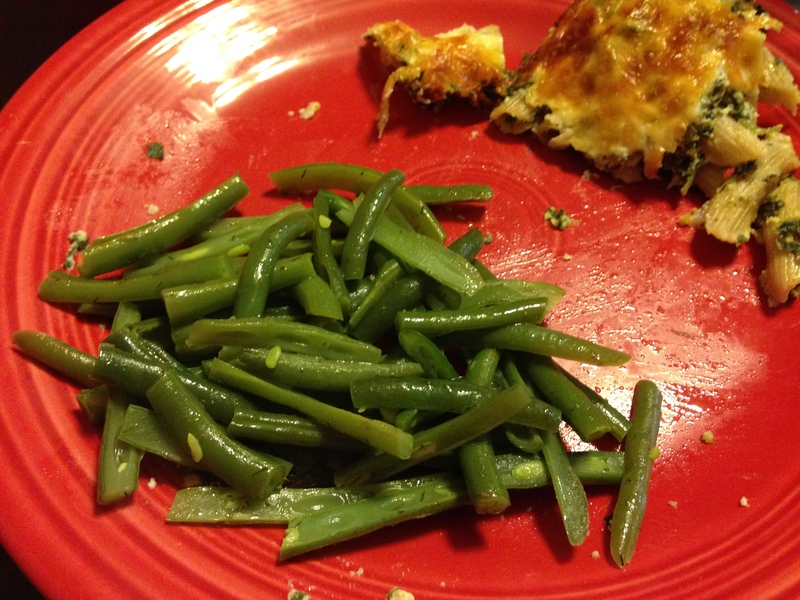 Apparently, “fastidieux.” Haricots vert et fastidieux. That’s what these are. Listen to these instructions and you’ll wish you were pounding little pieces of beef to 1/8 inch thick. 8 cups of whatevs. How great is that? Random half bags of frozen veggies in the freezer staring you in the face? Toss em in! Recipe last night only used one of two potatoes now you’re stuck with one potato? Toss it in! 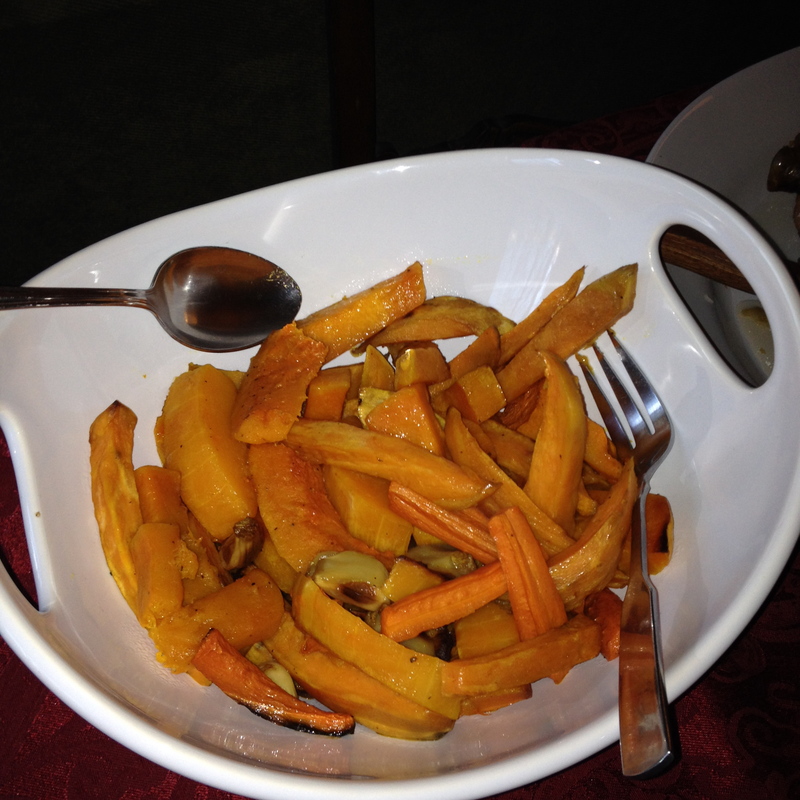 I had leftover calabcita from September’s squash substitutions. I had a bunch of lima beans from making a succotash for J. I had a ton of frozen corn because Everyday Food recipes use a surprising amount of corn. It all went in there. I think I actually used 6 or 7 different vegetables. 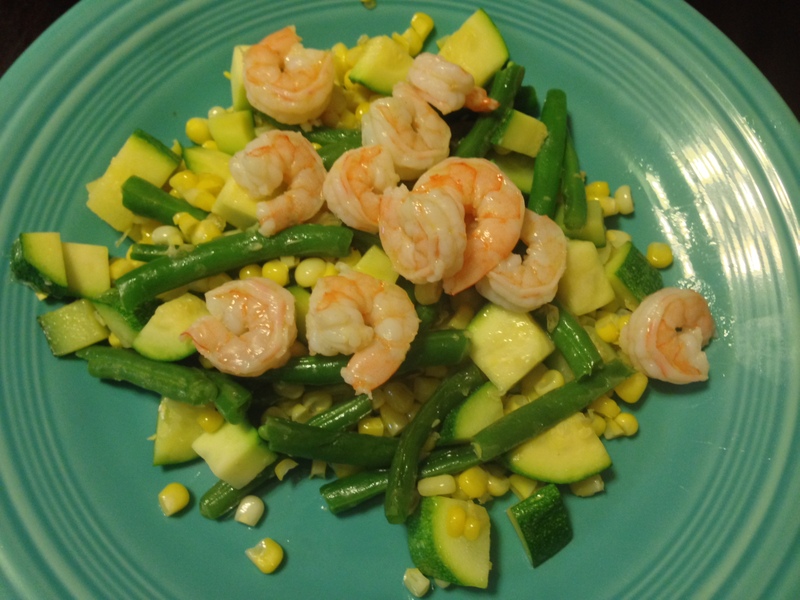 I think this makes this a great recipe for times when your freezer or fridge has an odd glut of vegetables. Or for when lots of things look good at a farmers’ market and you can’t think of what else to do with it. 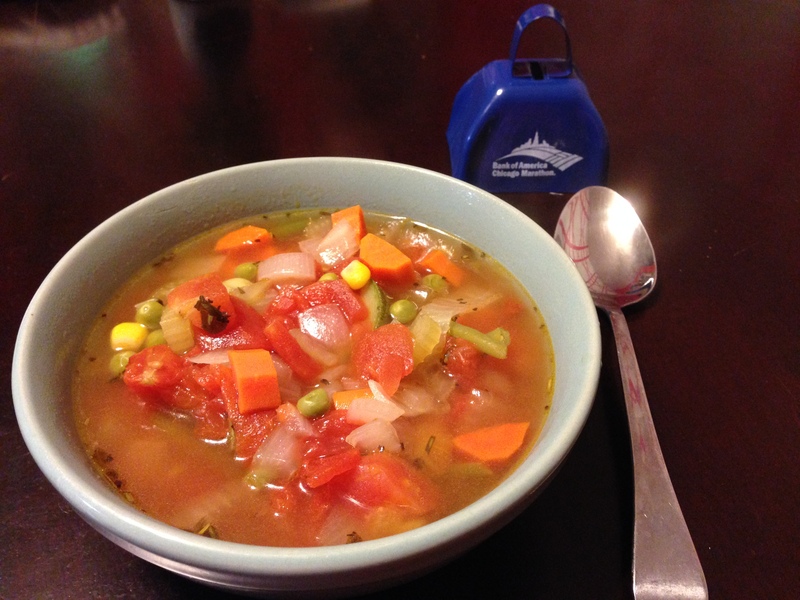 No matter the reason, this is a tasty soup. I look forward to having it some night when I’m too lazy to cook and too guilty/cheap to order in.